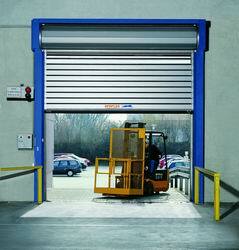 The Efaflex SST High Speed Turbo Door provides exceptional security and insulation for small or large openings. 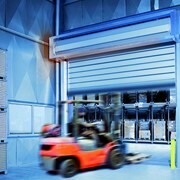 Warehousing, logistics, coldrooms, carparks, and specialised clean and processing rooms will all benefit from this type of high speed roll door. 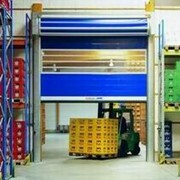 DMF are exclusive agenrts for Efaflex Gmbh, the global expert and leader in high speed roll doors. 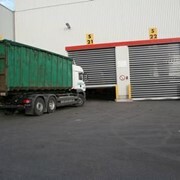 EFAFLEX High-Speed Turbo Doors are the unique result of creative and innovative engineering worldwide. 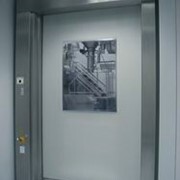 The EFAFLEX design engineers have succeeded again in creating a revolutionary door system based on the visions of its users. 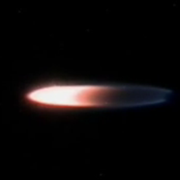 Called "turbo" becasue of the unmatched speeds of up to 4m/sec. The result is a high-speed door for internal or external use consisting of core filled laths providing strength and insulation. 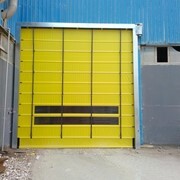 Equipped with a high insulation door panel from thermally separated slats, a K-factor of at least 0.5 W/m2K is achieved. The seals employed prevent unwanted air or temperature exchanges. The result is constant, climatic conditions. 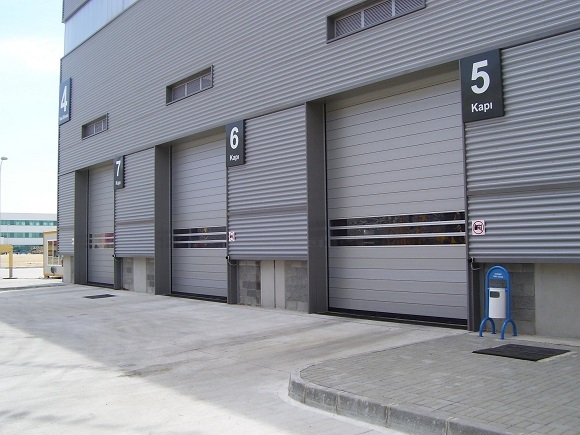 A high travel speeds and a practically wear free door panel qualify the SST as a professional single door solution, as opposed to a PVC high speed door and roller shutter door combination. The construction is designed for at least 200,000 operations per year, the highest availability with the least maintenance expenditure is guaranteed. 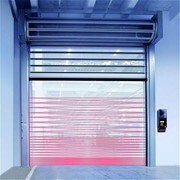 Also available if selected is self coloured grey PVC filling or absolutely clear vision slats from acrylic glass (2). 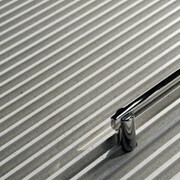 The closing profile is manufactured from aluminium, a flexible rubber profile provides the perfect sealing to the floor. 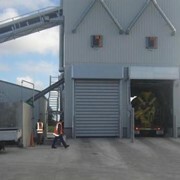 The 40,60 or 100mm thick door panel is provided with a thermally separated, wear free, double sealing lip to the frame. This excludes unwanted air or temperature exchanges over the whole door construction. 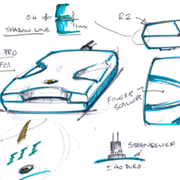 At the same time it provides effective finger protection which even now meets all future European Standards. 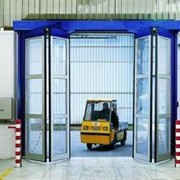 The securing of the door closing point is achieved by means of a safety contact strip or through an opto-electronic infra-red light grid in the side frames. A frequency controlled high performance drive guarantees the highest reliability even with external loading. 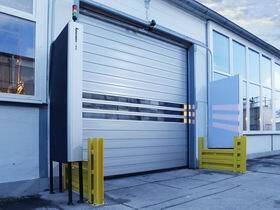 The SST is a professional solution especially for temperature controlled zones. 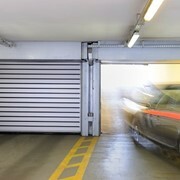 Electronic closing edge safety protection is incorporated as standard in the closing profile of the high speed door. In combination with the most modern control electronics, this very reliable system provides for the quickest reaction time. NEW. 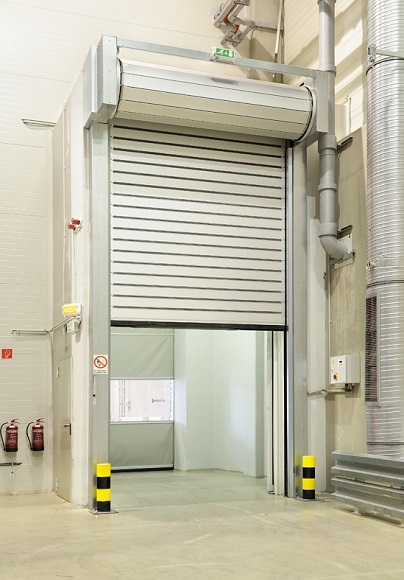 If desired, the Active Crash System with automatic return can also provide additional collision protection to the lower door area.This feature allows the bottom 900mm of the door blade to non destructively crash out of the columns, and automatically realign back into full operation.